1) Hands up. How many of you read the above line and then glanced straight to the image to see what in Earth’s animal kingdom a ‘lubber’ might be? Well, I would have. If I hadn’t written that is. Grasshoppers, ah now that sounds a familiar critter, but lubbers? Nope, I hadn’t heard that word until I started writing this blog. 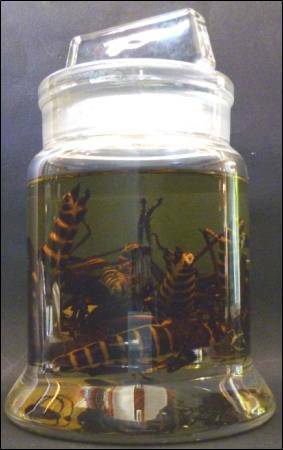 These grasshoppers are in fact called Eastern lubbers (being from eastern and southeastern USA), indicating to those on the ball that there is more than type. The Eastern lubber is a large and colourful little fellow, that lacks the ability to fly. 2) For a grasshopper, the Eastern lubber is really rather large. Unfortunately, this makes them a bit of a nuisance to farmers given that a larger lubber tummy requires a larger amount of farmers crop to fill it. Add that to the fact that lubbers travel in packs (or swarms if you’d rather be scientific and accurate than interpretative and story-telling-y) and you have at least the potential for a veritable plague on your hands. Populations can explode (in terms of increasing numbers, not fireworks) if a variety of phenomena occur in a certain order, such as such as weather and rates of parasitism by beneficial insects that would otherwise limit the growth of the lubber populations. 3) Lubbers only breed once each year, meaning that the populations see a lull during the colder periods of autumn and winter whilst a baby lubber boom occurs towards the end of the summer. The Eastern lubber mostly prefers to live in low-lying, moist environments but is known to overflow into neighboring habitats as it fancies. 4) The Eastern lubber is a strict vegetarian. It is happy to eat quite a wide variety of plantlife, which makes it a very adaptable species. However it particularly enjoys a bit of the extremely pretty amaryllis or if that isn’t available, then any of its close relatives. 5) After mating during the summer, the female chooses a patch of soil and displays exemplary dexterity with the tip of her abdomen to create a small hole around 5 cm deep. Up to 50 eggs, contained within a light foamy froth are then laid in the hole. 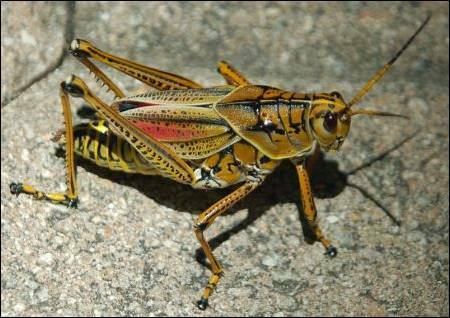 As you probably know, grasshoppers have an exoskeleton, or hard outer ‘skin’ if you will. Therefore to grow, they will successively molt, each time producing a larger exoskeleton. The Eastern lubber will molt five times, with each stage lasting between 15 and 20 days each. At each of these stages the lubber us called a nymph, until it finally transforms into its adult morph.